Increase awareness of, and consideration for, Direct Line’s Landlord Insurance product. Being a landlord can be a full-time job. And for a lot of them, they already have one. They have places to be. Families to take care of. Running a property can be time-consuming, confusing and stressful. A large number of landlords have little experience with actually doing it. We call them accidental landlords. Undertaking all UX & IA activities. These days we increasingly organise and live our lives through our phones. So we created an app that liberated landlords by providing them with the tools to run multiple properties from one convenient place, giving them the freedom to do it anytime and anywhere. We devised an app that allowed landlords to store information for up to five properties in one handy and secure place. Audience research was crucial; we spoke to various members of our target audience in order to understand the tasks and specific issues that they encountered in their role of Landlord, as well as explore their needs for certain tools that would help them on a day-to-day basis. We used these insights to produce a useful prioritised feature list and constructed initial user journeys and application maps. Detailed wireframes were produced. 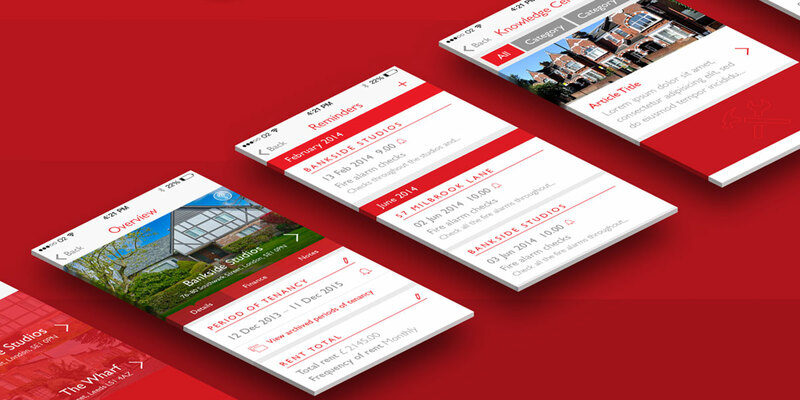 As the app was to be developed by an external team, the documents needed to be as clear and detailed as possible. There were ad-hoc calls as well as regular scheduled meetings in order to ensure that the development was in-line with the vision described in the wireframes and interface designs. The resultant app takes care of all the hard work; it crunches all the numbers, letting users track income, expenses and monitor return on investment. It keeps tenant and rental details organised and accessible – this starts to become a massive help when managing more than one property. And perhaps best of all, Mobile Landlord sends reminders for things that can slip your mind like specific check ups and inventory notes as well as appliance checks and services. But we didn’t just stop there. To make sure the app was the handiest tool and resource possible, we created The Knowledge Centre, a library of quick tips and guides on everything from deciphering cryptic acronyms to tax news. The app also ties into Direct Line’s back-end engine, allowing Landlords to quickly get quotes and easily purchase insurance.